The Kik app works like text messaging, but it is free to share chats, pics, videos, gifts or special emoji over WiFi. 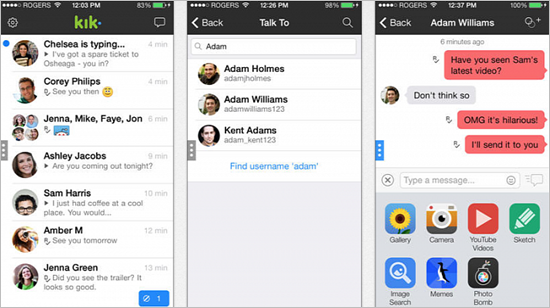 Kik allows its users to find new friends and chat with them anonymously through a username. That’s why it has become widely popular with young people. After a certain point, Kik conversations are important. However, losing messages is common when you can’t see old Kik messages or just deleted them. Therefore, this post shows you how to recover old or deleted Kik messages and make a backup from iPhone or Android phone. It is possible your friends you were chatting with still have the old conversations that you just lost or deleted on your own Kik. So you can contact the friends who you sent the messages to and then ask them to send back those chats or screen shots to you. It is easy! Why not have a try? In fact, Kik doesn’t store any of your messages, so once you deleted your chats, Kik can’t retrieve them for you. However, some developers have specially designed data recovery applications to recover Kik messages. For iPhone users, Free iPhone Recovery or iMyfone D-Back is able to retrieve recently deleted Kik messages directly from iPhone SE/6s/6/5s/5/5c/4s/4 or retrieve old Kik messages (including Kik photos and videos) from previous iTunes or iCloud backup. Step 1. Run iPhone Recovery tool on PC and check Kik messages; Go to the next. Step 2. 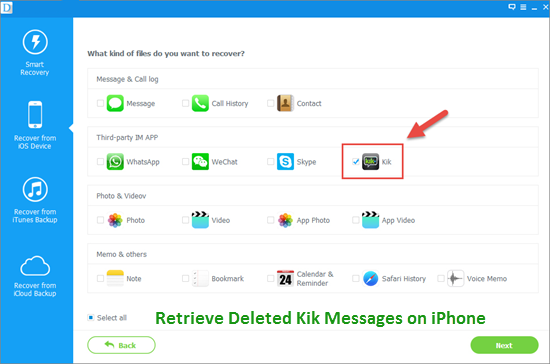 Scan deleted or lost Kik data from iPhone or iTunes backup. Step 3. Preview and recover the Kik messages you want; Export and backup them onto computer. For Android phones (rooted only), you can try GT Kik Recovery to recover lost or deleted messages on Kik but it can’t guarantee the success of recovery due to the diversity of Android system versions. Kik itself currently doesn’t provide a way to save or backup your Kik messages. You are only allowed to see the last 1000 chats within 48 hours on iPhone (600 chats on Android). So it is quite necessary to regularly backup important messages on Kik. Maybe, you can use build-in screenshot or screen-capture to save only parts of your chats as pictures. How about backuping the majority of your Kik messages? Backup the whole data of your device with iTunes or iCloud. This won’t allow you to see the detailed Kik messages in a backup file. As mentioned, use iPhone Recovery or iMyfone D-Bank to regularly backup and extract all Kik messages from iPhone to computer. Thus, you can see old Kik chats at any time. These Kik backup Apps in Google play like Backuptrans, Backup Text for Kik, Backup & Restore for Kik are worth trying to backup Kik messages.